There are more then enough reports listed on this page which expose the biased research and promotional methods used by the pharmaceutical industry that serve corporate profit rather than people's health and well being. NGO's (Non governmental organizations) and Independent research support groups have had to surface to inform consumers about vital drug information and present the real figures regarding consumer health and drug safety. This profit industry range from side effects associated with thousands of medications, preventative medication education on natural remedies. The research documentary Generation RX proves the deliberate chemical lobotomizing of an entire generation for profits & societal degeneration. The FDA is completely with out any security or a corporation charter to police it. A corporation charter can prevent the conditions from allowing this to surface in the first place. Currently a lack of corporation charters allows it to surface then addresses it after complaints or ill effects appear. Its only AFTER complaints and independent investigation that the current limited educational programs has been effective in making the FDA do what its supposed to be doing at the source. There are enough victims to warrant votes to help erect the corporation charter (This is as easy as signing your easy name, email and country link has been included below). There is also enough education now to justify the creation of support groups such as the concept of Pharmaceuticals anonymous to help people get off these drugs. With out groups such as the National Health Federation an international nonprofit, consumer-education, health-freedom organization there would be no plan in effect working to protect individuals' rights to choose to consume healthy food, take supplements, and use alternative therapies without government restrictions.The best answer's "they have" are contained in Pharma 2020: The visions. Summary:Big Bucks, Big Pharma pulls back the curtain on the multi-billion dollar pharmaceutical industry to expose the insidious ways that illness is used, manipulated, and in some instances created, for capital gain. Focusing on the industry's marketing practices, media scholars and health professionals help viewers understand the ways in which direct-to-consumer (DTC) pharmaceutical advertising glamorizes and normalizes the use of prescription medication, and works in tandem with promotion to doctors. Combined, these industry practices shape how both patients and doctors understand and relate to disease and treatment. Ultimately, Big Bucks, Big Pharma challenges us to ask important questions about the consequences of relying on a for-profit industry for our health and well-being. Featuring interviews with Dr. Marcia Angell (Dept. of Social Medicine, Harvard Medical School; Former Editor New England Journal of Medicine), Dr. Bob Goodman (Columbia University Medical Center; Founder, No Free Lunch), Gene Carbona (Former Pharmaceutical Industry Insider and Current Executive Director of Sales, The Medical Letter), Katharine Greider (Journalist; Author, The Big Fix: How the Pharmaceutical Industry Rips Off American Consumers,), Dr. Elizabeth Preston (Dept. of Communication, Westfield State College), and Dr. Larry Sasich (Public Citizen Health Research Group). The documentary Big bucks, Big Pharma can be seen on google video here. Please review the list of organisations, articles and videos at the end of this presentation on the bottom of the page. Furtherevidence of concern is presented by Dr Joseph Mercola. Additional Video disclosures By Dr Mercola. Most Americans WANT and NEED not-for profit healthcare insurance (whether some of you here do or not). Most industrialized countries already have it. America is NOT ALLOWED to have it, because it will cost the Pharms and Privates billions in profits that they get from denying care to sick people. The overt corruption here, directly tied to the pharm and private insurance lobbyists, is so sickening, that nearly EVERY SINGLE SENATOR (except for 3 ; Saunders, Burris, and the new guy from Minnesota) should lose in their next Primary election. And many of "the tax payers" will be working for that. Learn Government's underlying and primary motive for the actions and decisions that they enact. This applies to the Health Care bill that just passed; financial bailouts that occurred; the price of energy in this country; and the perpetual war that is maintained.There is no gray area here "if" you look and see the reality of the core motive. As has been the case for hundreds of years, if not millenniums, easy money has been a core drive behind the human condition. Guaranteeing a massive profit due to your own actions is a strong driving force no matter who is behind the steering wheel. Make sure you read to the end. You will be amazed.Make sure you read all the way past the list of the drugs. The woman that signed below is a Budget Analyst out of federal Washington , DC offices. Did you ever wonder how much it costs a drug company for the active ingredient in prescription medications? 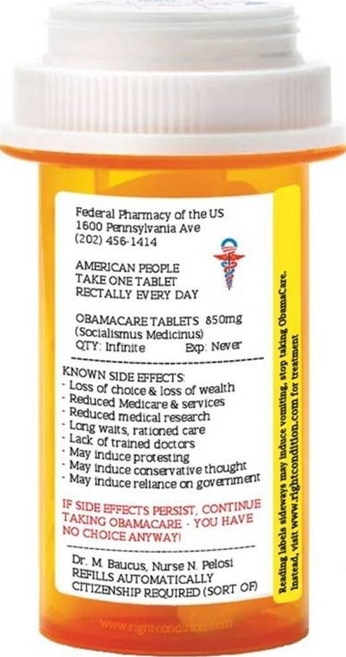 Some people think it must cost a lot, since many drugs sell for more than $2.00 per tablet. We did a search of offshore chemical synthesizers that supply the active ingredients found in drugs approved by the FDA. As we have revealed in past issues of Life Extension a significant percentage of drugs sold in the United States contain active ingredients made in other countries. In our independent investigation of how much profit drug companies really make, we obtained the actual price of active ingredients used in some of the most popular drugs sold in America. It pays to shop around! This helps to solve the mystery as to why they can afford to put a Walgreen's on every corner. On Monday night, Steve Wilson, an investigative reporter for Channel 7 News in Detroit, did a story on generic drug prices gouging by pharmacies. He found in his investigation that some of these generic drugs were marked up as much as 3,000% or more. So often we blame the drug companies for the high cost of drugs, and usually rightfully so. But in this case, the fault clearly lies with the pharmacies themselves. For example if you had to buy a prescription drug, and bought the name brand, you might pay $100 for 100 pills.The pharmacist might tell you that if you get the generic equivalent, they would only cost $80, making you think you are saving $20. What the pharmacist is not telling you is that those 100 generic pills may have only cost him $10! 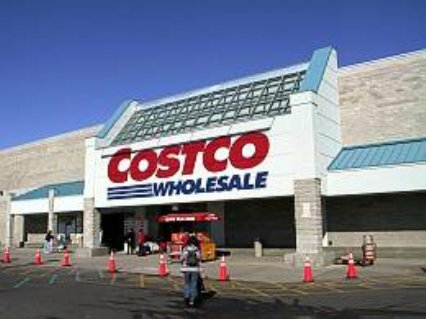 At the end of the report, one of the anchors asked Mr. Wilson whether or not there were any pharmacies that did not adhere to this practice, and he said that Costco consistently charged little over their cost for the generic drugs.I went to the Costco site, where you can look up any drug, and get its online price. It says that the in-store prices are consistent with the online prices. I was appalled. Just to give you one example from my own experience I had to use the drug Compazine which helps prevent nausea in chemo patients.I used the generic equivalent, which cost $54.99 for 60 pills at CVS. I checked the price at Costco, and I could have bought 100 pills for $19.89. For 145 of my pain pills, I paid $72.57. I could have got 150 at Costco for $28.08.I would like to mention, that although Costco is a 'membership' type store, you do NOT have to be a member to buy prescriptions there as it is a federally regulated substance. You just tell them at thedoor that you wish to use the pharmacy, and they will let you in..I am asking each of you to please help me by copying this letter, and passing it into your own e-mail, and send it to everyone you know with an e-mail addres. Having spent the past twelve months investigating Codex Alimentarius, I am deeply disturbed by the almost total lack of awareness (or even interest) with regard to the implications of this pernicious global Commission, particularly amongst those most affected by the excesses of this restrictive legislation. In the words of the National Health Federation[i], the aims and objectives of Codex Alimentarius are as follows: * Only low-potency, “me too” supplements available that will do nothing for your health. * All or most foods genetically-modified. * Beneficial supplements unavailable or sold by prescription only. For many people, this agenda is so outrageous, they cannot believe such goals are achievable; yet this may well be the reality as soon as 31st December 2009, if the Codex Alimentarius Commission continues to disregard input from those who offer a counter perspective to the combined forces of Big Farmer & Big Pharmahealth. Dr. Horowitz urges an investigation of Dr. James S. Robertson, Englands leading bioengineer of flu viruses for the vaccine industry, and avid promoter of U.S. Government funding for lucrative biodefense contracts, along with collaborators at the US Centers for Disease Control & Prevention (CDC). These suspects helped Novavax, Inc., in Bethesda, Maryland, produce genetically-modified recombinants of the avian, swine, and Spanish flu viruses, H5N1 and H1N1, nearly identical to the unprecedented Mexican virus that is allegedly spreading to the United States at the time of this posting. The outbreak was precisely timed to promote the companys new research and huge vaccine stockpiling contract. The Burgermeister case against the World Health Organization (WHO) and other government agencies and high ranking officials is starting to spread across the Internet. But despite the fact that it could easily be one of the hottest news headlines this year, not a word can be found about it in the mainstream media. This has led many to dismiss it as either a hoax, or an attempt to raise the stakes by a demented conspiracy theorist.However, based on Jane Burgermeister’s own blog, interviews, and the documentation found on the site WakeNews, with links to the criminal charges and bioterrorism evidence filed with the FBI in Austria on June 10, 2009, the suit appears quite real, and Burgermeister quite serious about her allegations. And as for the conventional media blackout, well… that shouldn’t come as a major surprise, all things considered, and can’t be used as proof to dismiss the validity of the story. After all, I’ve written enough articles discussing how the media is in large part bought and paid for by the pharmaceutical industry. Source. The next film in the cause of effect series "Believers Beware", goes from covering the history of our external experiences, to exploring our internal existence. Beginning with the food we put in our bodies, and the effect this has on our physical, mental, and spiritual abilities, the film takes a critical look at the FDA and other regulatory bodies who claim to represent the best interest of the consumer, but in practice reflect and protect the big pharmaceutical and medical companies. Covered especially is the plan put in place called CODEX Alimentarius, a law to be enforced by the World Trade Organization, that renders the sale of ordinary vitamins and minerals as well as all holistic and natural supplements as being illegal without prescription - starting December 31, 2009. The majority of the general public will not be aware that GM food, food additives and artificial colorings ARE dangerous.The European Food Safety Authority has been studying the effects of these products and has uncovered a host of potential problems with their usage, especially in the developing bodies of children. Further Information. 'We Become Silent’ is narrated by Dame Judi Dench, the noted UK actress who has won multiple Golden Globe awards, an Oscar, and a Tony for her on-stage work, in addition to dozens of other honors throughout her prestigious career. We Become Silent - Pharmaceutical giants and other globalized bureaucratic interests are threatening our very health freedoms. Our access to natural foods, vitamins, and herbs will be severely crippled, and eventually non existent. Generation Rx Film -An excerpt from the feature-documentary 'Generation RX. 'The film discusses a pattern of collusion between drug manufacturers and their regulatory watchdogs at the FDA - of evidence hidden from the general public, despite the risks being well-known long before antidepressant drugs were approved for the marketplace. Vaccines: Childhood Vaccinations: Mercury in Vaccines, Thimerosal Controversy, Possible Links to Autism in Children. The last few decades have seen steady and dramatic increases in the incidence of boys and young men suffering from genital deformities, low sperm count, sperm abnormalities and testicular cancer.baby Some researchers say that declining male fertility rates could be the first sign of extinction.The Disappearing Male takes a close and disturbing look at what many doctors and researchers now suspect are responsible for many of these problems: a class of common chemicals that are ubiquitous in our world.Found in everything from shampoo, sunglasses, meat and dairy products, carpet, cosmetics and baby bottles, they are called "hormone mimicking" or "endocrine disrupting" chemicals and they may be starting to damage the most basic building blocks of human. Eleven years ago, Boyd Graves a lawyer and 1975 graduate of the US Naval Academy discovered he was HIV AIDS positive. Rather than lay down and accept it as a death sentence, he resolved to learn all he could about the disease in hopes of seeking a cure. What Graves discovered shocked and enraged him. Based upon information he discovered in the public domain and through the Freedom of Information Act, he concluded the US Government was involved in a super secret Special Virus Cancer Program he feels is the cause of the dreaded disease HIV/AIDS.In 1999, Graves discovered the secret 1971 Special Virus Cancer Flow Chart which spells out the incremental development of a laboratory produced virus designed to attack and undermine the immune systems of people of African descent. Graves has sought support from various government agencies, namely, the General Accounting Office, former Ohio Congressman Trafficant, AIDS organizations and finally the courts. 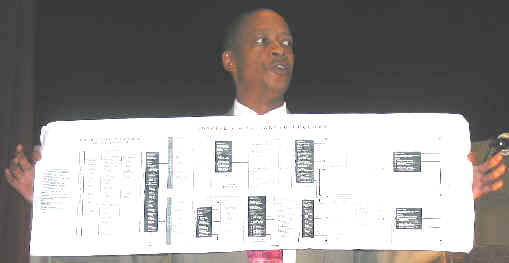 On October 24, Graves will go into federal Court in San Diego California in a suit he filed in an attempt to get the US Government to 'fess up to its role in the creation of HIV AIDS.While many have attempted to discredit and dismissed Graves' assertions, few have been able to refute the existence of the Flow Chart he discovered in 1999. The very existence of these government documents provide credence to the suspicions of many African Americans that the US Government was indeed behind the creation if HIV/AIDS.For Graves, it has been a lonely, uphill, and often desperate battle. Not only has he had to endure charges of being a paranoid "conspiracy kook" by those who don't believe the US Government is capable of such reprehensible behavior. (They are either ignorant of or in denial about blankets laced with smallpox given to Native Americans by the US government or infamous programs like the Tuskegee Experiment where hundreds of infected African American males in Alabama were denied treatment so the US government could chronicle the long term effects of untreated syphilis. Graves' charges also rankle many in the academic, pharmaceutical, and public health communities who have built reputations, careers and fortunes on the orthodoxy that AIDS originated in Africa the result of human interaction with infected primates. "Indeed the truth is the HIV/AIDS enzyme is the result of a designer virus program of the United States of America and it is conclusive proof," corrected Graves, who has experienced the biases, ostracism, rejection, and government harassment due to being infected by AIDS and because he dared to expose the government's involvement in the creation of HIV/AIDS. Nevertheless he tirelessly lectures, gives radio interviews, and speaks at conferences trying to alert the public about the government's diabolical program of population control. "We've been at this now for eleven years following my diagnosis of HIV in 1992," Graves revealed. "I didn't stick my head in the sand and as a result of that now eleven years later we have some of the official documents, even the experiments and contracts of a secret federal virus program entitled 'The US Special Virus Program'. These aren't my documents, they are the government's. "Graves is obsessed with getting the word out and sees himself as a modern day David battling the formidable Goliath of the US government. "I'm involved in a modern venue of David and Goliath because there is no more bigger giant than the United States Government. The truth provides strength. I find comfort in the truth and it gives me the drive and initiative to get up each and every day to continue our efforts to expose the truth because over time the truth has always risen to the top and its going to happen here. "Graves put the flow chart on his website www.BoydGraves.com and over 26,000 people have downloaded it. "We've got two dozen scientists and medical doctors who have reviewed this material and to a person, they all agree this federal program is at the heart of the genesis of HIV and AIDS. "Graves has a special interest in the program for he was diagnosed HIV positive. In doing his research he came upon a patented cure for AIDS which he took and now says he is symptom free. "The United States patented the cure for AIDS in 1997 and that patent number is 5676977 and I tell people to go to www.google.com and type in U S Patent and that number and the information will come up. I tell people to go to the main library and look into the world catalogue data base and put in 'Special Virus Cancer Program' and you will find at least three four or five of those progress reports of the development of HIV are in the main library. Some of these reports are in the public domain. "Graves knows of what he speaks because he took the cure himself in 2001. "Twenty-two months ago I took the US patented cure for AIDS. It is a one time injection, I call it an infusion because it takes about twenty minutes. It's a large plunger kind of thing but that is all I've had and physically I am fine and symptom free. "Graves is eager to get the US Government in court. Earlier suits he filed were dismissed but on October 24th at 11 AM he will have his day in court to plead his case before the US Federal Court in San Diego California in his attempt to force the government to reveal the sordid details about its role in the creation of HIV/AIDS. Graves also hopes to force the government to reveal the patented cure.Graves is a law school graduate but has not taken the bar exam in any state. Ibogaine - Immediate reductions in drug craving, no withdrawal symptoms and more self-control. These chemical companies are very big and very powerful They do not reproduce chemical copies of powerful healing herbs for the good of human kind Their only intent is profit, regardless of any BODY. Proof? Their drugs sent 25,000 Australians into hospital last year, suffering from their adverse effects alone. In America too, over 100,000 people died last year from prescription drugs, (including 1,000 suiciding on Prozac alone!) and not one death from herbal medicine!Yet, here in Australia, Coltsfoot is still prohibited. Has it harmed or killed anyone, anywhere? No! It is the most effective remedy for coughs and lung congestion, but along with all the other great lung herbs like Lobelia inflatá, ephedra and borage, it remains prohibited. Is it any surprise that the biggest money spinners for the pharmaceutical companies are the products that copy the actions of these wonderful herbs. People have died on these commercial products, yet they are still allowed to be sold over the counter without prescription!So, the far safer and more effective herbs are denied from us, the people. Why? The pharmaceutical corporations cannot patent (and therefore profit on) herbs but they can profit enormously on patented chemicals and pills. Their modus operandi is to synthesise the herb and then work to have the safer more effective natural herb prohibited.There are still well over 100 comparatively safe herbs that are in government ‘jails’ (on the restricted or prohibited list), yet these plants are on this planet for our benefit.TO DENY US OUR ONE OF NATURAL HERBS IS TO DENY US OUR NATURAL RIGHTS.Natural herbs of this planet must never be banned from us of this planet. To do so is unnatural, creating bad KARMA. And we certainly have created much bigger and disastrous problems from the prohibition of psycho-active herbs. The most effective and least harmful way to winning the so called drug war is to release the ‘prisoners’, ie: the herbs. The role of our government is to educate us about the dangers (and the effects) of all popular drugs. Banning them automatically creates an industry — legal and illegal!Another example of pharmaceutical company industry influence on our governments, is the use of dangerous methadone (and even worse — naltrexone) for heroin addiction; yet IBOGAINE,and now KRATOM, both far safer natural herbs that have been proven to be successful addiction interrupters, have been totally banned in Australia! Why is there no research being carried out in Australia into the proven effectiveness of IBOGAINE and KRATOM for addiction interruption? The following List of dead scientist and microbiologist gives further justification for investigation and reform into the pharmaceutical cartels. This evidence speaks for it self. One must contemplate the magnitude and uniform patterns of death involved in the following scientists. Which industries benefit from this suppression and deaths? In Lies We Trust: The CIA, Hollywood and Bioterrorism - Official Release. The public can only find security for these issues in one way, all are needed to consolidate and sign up to investigate and regulate these issuesat a federal level. Please sign the petitions at the bottom of this page! This "medical industry" has a record that is not publicly well known. A Brief History of Secret Human Experimentations on Involuntary or Uninformed Subjects from 1931. • 1931 - Dr. Cornelius Rhoads, under auspices of the Rockefeller Institute for Medical Investigations, infects human subjects with cancer cells. He later established the U.S. Army Biological Warfare facilities in Maryland, Utah, and Panama, and is named to the U.S. Atomic Energy Commission. While there, he begins a series of radiation exposure experiments on American soldiers and civilian hospital patients. • 1932 - The Tuskegee Syphilis Study begins. 200 black men diagnosed with syphilis are never told of their illness, are denied treatment, and instead are used as human guinea pigs in order to follow progression and symptoms of the disease. They all subsequently die from syphilis; their families never told that they could have been treated. order to study effects of new and experimental drugs to combat the disease. Nazi doctors later on trial at Nuremberg cite this American study to defend their own actions during the Holocaust. "experiments" to "investigations" or "observations" whenever reporting a medical study performed in one of the nation's veteran's hospitals. • 1947 - Colonel E. E. Kirkpatrick of the U.S. Atomic Energy Commission issues a secret document (Document 07075001, January 8, 1947) stating that the agency will begin administering intravenous doses of radioactive substances to human subjects. American intelligence. Human subjects (both civilian and military) are used with and without their knowledge. • 1947 – The Navy conducted the first known post-war mind control program, Project CHAPTER, which continued the drug experiments. Decades later, journalists and investigators still haven't uncovered much information about this project - or, indeed, about any of the military's other excursions into this field. We know that the Army eventually founded operations THIRD CHANCE and DERBY HAT; other project names remain mysterious, though existence of these programs is unquestionable. • 1950 - Department of Defence begins plans to detonate nuclear weapons in desert areas and monitor downwind residents for medical problems and mortality rates. • 1950 - In an experiment to determine how susceptible an American city would be to biological attack, U.S. Navy sprays a cloud of bacteria from ships over San Francisco. Monitoring devices are situated throughout the city to test extent of infection. Many residents become ill with pneumonia-like symptoms. sensitive areas. This began the CIA's first structured behavioural control program. Their goals consisted of "controlling an individual to the point where he will do our bidding against his will and even against such fundamental laws of nature as self-preservation." Some of their experimental subjects included North Korean prisoners of war and suspected double agents. • 1951 - Project BLUEBIRD was renamed Project ARTICHOKE. The CIA director approved a liaison with the Army and Navy who were interested in finding a truth drug. Another liaison was formed with the Air Force who wanted to study interrogation techniques. Some of Project ARTICHOKE's experimental subjects included: suspected agents, suspected double agents, people who "had a known reason for deception," American college students (supposedly for more benign testing), and foreigners (since the CIA was more likely to try certain procedures out on them rather than American citizens. )"Terminal," or "to the death" experiments were usually carried out in other countries. Control methods used on two agents involved narco-hypnosis (drugs and hypnosis). Subjects were hypnotically regressed and made to relive past experiences. Post-hypnotic suggestions were given to induce total amnesia of their interrogations. The CIA called this experiment "very successful." • 1951 - Department of Defence begins open-air tests using disease-producing bacteria and viruses. Tests last through 1969. Concern exists that people in surrounding areas have been exposed. • 1951 - Project CHATTER, a highly classified Navy program to search for a truth drug, began. They were looking for a way to make someone talk "fast" in event of a security emergency. These experiments used barbiturates, amphetamines, and heroin. The drugs were supplied by Bureau of Narcotics and pharmaceutical companies. Subjects were mostly students. 1953 Project CHATTER was abandoned by the Navy. • 1952 - Project CASTIGATE began when the Navy and the CIA partnered to test a "secret potion" consisting of a depressant, a stimulant, and active ingredient in marijuana. The drugs were to be administered over a 3-day period in an experiment in Germany at a secret CIA base on a military installation. Experimental subjects included one known double agent, one suspected double agent and three defectors. Project CASTIGATE was considered a failure. • 1952 - MKNAOMI (Pronounced M-K NAOMI with M-K standing for mind control.) TSS's agreement with the Special Operations Division of the Army's biological research center at Fort Detrick, Maryland. SOD's job was to produce germ weapons for the CIA's use. of the experiments, the CIA used many hospital patients, volunteers (mostly students), inmates who were usually paid for their participation with more drugs, and eventually anyone the CIA could get, without their consent. The CIA "scientists" even engaged in misting and spraying unwitting American citizens as they walked down busy city streets. Later they would study how to manipulate genes and develop compounds to simulate heart attack and stroke. • 1953 - U.S. military releases clouds of zinc cadmium sulphide gas over Winnipeg, St. Louis, Minneapolis, Fort Wayne, the Monocacy River Valley in Maryland, and Leesburg, Virginia with intent to determine how efficiently they could disperse chemical agents. • 1953 - Joint Army-Navy-CIA experiments are conducted in which tens of thousands of people in New York and San Francisco are exposed to the airborne germs Serratia marcescens and Bacillus glogigii. populations with biological agents, releases a bacteria withdrawn from the Army's biological warfare arsenal over Tampa Bay, Fl. • 1955 - Army Chemical Corps continues LSD research, studying its potential use as a chemical incapacitating agent. More than 1,000 Americans participate in the tests that continue until 1958. • 1956 - U.S. military releases mosquitoes infected with Yellow Fever over Savannah, GA and Avon Park, Fl. Following each test, Army agents posing as public health officials test victims for effects. • 1965 - Project CIA and Department of Defence begin Project MKSEARCH, a program to develop capacity to manipulate human behaviour through mind-altering drugs. • 1965 - Prisoners at Holmesburg State Prison in Philadelphia are subjected to dioxin, the highly toxic chemical component of Agent Orange used in Viet Nam. The men are later studied for development of cancer. This indicates that Agent Orange had been a suspected carcinogen all along. certain drugs on humans and animals. • 1966 - U.S. Army dispenses Bacillus subtilis variant niger throughout New York City subway system. More than a million civilians are exposed when army scientists drop light bulbs filled with the bacteria onto ventilation grates. • 1967 - CIA and Department of Defence implement Project MKNAOMI, successor to MKULTRA and designed to maintain, stockpile and test biological and chemical weapons. • 1968 - CIA experiments with possibility of poisoning drinking water by injecting chemicals into the water supply of the FDA in Washington, D.C.
biological agent to which no natural immunity exists. techniques are used to produce AIDS-like retroviruses. • 1970 - United States intensifies its development of "ethnic weapons"
(Military Review, Nov., 1970), designed to selectively target and eliminate specific ethnic groups who are susceptible due to genetic differences and variations in DNA. • 1975 - The virus section of Fort Detrick's Center for Biological Warfare Research is renamed the Fredrick Cancer Research Facilities and placed under supervision of the National Cancer Institute (NCI) . It is here that the U.S. Navy initiates a special virus cancer program is initiated, purportedly to develop cancer-causing viruses. It is also here that retrovirologists isolate a virus to which no immunity exists. It is later named HTLV (Human T-cell Leukaemia Virus). • 1977 - Senate hearings on Health and Scientific Research confirm that 239 populated areas had been contaminated with biological agents between 1949 and 1969. Some of the areas included San Francisco, Washington, D.C., Key West, Panama City, Minneapolis, and St. Louis. • 1978 - Experimental Hepatitis B vaccine trials, conducted by CDC, begin in New York, Los Angeles and San Francisco. Ads for research subjects specifically ask for promiscuous homosexual men. • 1981 - First cases of AIDS are confirmed in homosexual men in New York, Los Angeles and San Francisco, triggering speculation that AIDS may have been introduced via the Hepatitis B vaccine. • 1985 - According to the journal Science (227:173-177), HTLV and VISNA, a fatal sheep virus, are very similar, indicating a close taxonomic and evolutionary relationship. (83:4007-4011), HIV and VISNA are highly similar and share all structural elements except for a small segment nearly identical to HTLV. This leads to speculation that HTLV and VISNA may have been linked to produce a new retrovirus to which no natural immunity exists. • 1986 - A report to Congress reveals U.S. Government's current generation of biological agents includes: modified viruses, naturally occurring toxins, and agents altered through genetic engineering to change immunological character and prevent treatment by all existing vaccines. research facilities at 127 facilities and universities around the nation. • 1990 - More than 1500 six-month old Black and Hispanic babies in Los Angeles are given "experimental" measles vaccine never licensed for use in United States. CDC later admits parents were never informed that the vaccine being injected to their children was experimental. • 1994 - With a technique called "gene tracking," Dr. Garth Nicolson at MD Anderson Cancer Center in Houston, TX discovers that many returning Desert Storm veterans are infected with altered strain of Mycoplasma incognitus, a microbe commonly used in biological weapon production. Incorporated into its molecular structure is 40% of the HIV protein coat, indicating it had been man-made. • 1994 - Senator John D. Rockefeller issues a report revealing that for at least 50 years Department of Defence has used hundreds of thousands of military personnel in human experiments and for intentional exposure to dangerous substances. Materials included mustard and nerve gas, ionizing radiation, psycho-chemicals, hallucinogens, and drugs used during the Gulf War. scientists who had performed human medical experiments salaries and immunity from prosecution in exchange for data on biological warfare research. • 1995 - Dr. Garth Nicolson uncovers evidence that biological agents used during Gulf War had been manufactured in Houston, TX and Boca Raton, Fl and tested on prisoners in Texas Department of Corrections. people who became victims of MK ULTRA and other mind-control experimental programs. • 1996 - Department of Defence admits that Desert Storm soldiers were exposed to chemical agents. --Expertise: Computer programmer and scientist at Essex University engaged in work for Marconi, who was hailed as an expert on super computers and computer-controlled aircraft. --Circumstance of Death: Fatal car crash when his vehicle went out of control across a dual carriageway and plunged onto a disused railway line. Police maintained he had been drinking but family and friends all denied the allegation. --Coroner's verdict: Accident. --Expertise: Head of the Work Study Unit at the Royal College of Military Science. --Circumstance of Death: Disappeared mysteriously in April 1983 without explanation. Presumed dead. --Expertise: Digital communications expert who had worked at GEC and at British Telecom's secret research centre at Martlesham Heath, Suffolk. --Circumstance of Death: Died as a result of falling from a hotel room in Abidjan, West Africa, while working for British Telecom. He had expressed fears that his life was in danger. --Coroner's verdict: Open. August 4, 1986: Vimal Dajibhai, 24 --Expertise: Computer software engineer with Marconi, responsible for testing computer control systems of Tigerfish and Stingray torpedoes at Marconi Underwater Systems at Croxley Green, Hertfordshire. --Circumstance of Death: Death by 74m (240ft.) fall from Clifton Suspension Bridge, Bristol. Police report on the body mentioned a needle-sized puncture wound on the left buttock, but this was later dismissed as being a result of the fall. Dajibhai had been looking forward to starting a new job in the City of London and friends had confirmed that there was no reason for him to commit suicide. At the time of his death he was in the last week of his work with Marconi. --Coroner's verdict: Open. --Circumstance of Death: Died as a result of placing a ligature around his neck, tying the other end to a tree and then driving off in his car with the accelerator pedal jammed down. His unusual death was complicated by several issues: Sharif lived near Vimal Dajibhai in Stanmore, Middlesex, he committed suicide in Bristol and, inexplicably, had spent the last night of his life in a rooming house. He had paid for his accommodation in cash and was seen to have a bundle of high-denomination banknotes in his possession. While the police were told of the banknotes, no mention was made of them at the inquest and they were never found. In addition, most of the other guests at the rooming house worked at British Aerospace prior to working for Marconi, Sharif had also worked at British Aerospace on guided weapons technology. --Coroner's verdict: Suicide. --Expertise: MOD computer consultant and digital communications expert.--Circumstance of Death: Found dead in his flat in with his feet bound and a plastic bag over his head. Rope was tied around his body, coiling four times around his neck. --Coroner's verdict: Accident. --Expertise: Scientist formerly engaged in top secret work at the Royal College of Military Science at Shrivenham, Oxfordshire, and later deployed in a research department at the MOD. --Circumstance of Death: Death by carbon monoxide poisoning in his own garage, shortly after returning from a trip to the US in connection with his work. --Coroner's verdict: Accident. February 1987: David Skeels, 43 --Expertise: Engineer with Marconi. --Circumstance of Death: Found dead in his car with a hosepipe connected to the exhaust. --Expertise: Scientist at the Royal College of Military Science. He had been working on testing titanium for it's resistance to explosives and the use of computer analysis of signals from metals.--Circumstance of Death: Found dead allegedly from carbon monoxide poisoning, in his Oxfordshire garage. The circumstances of his death raised some elements of doubt. His wife had found him on his back with his head parallel to the rear car bumper and his mouth in line with the exhaust pipe, with the car engine running. Police were apparently baffled as to how he could have maneuvered into the position in which he was found. --Circumstance of Death: Found dead on in a house shared with two colleagues. He was found with a plastic sack around his head and several feet of cling film around his face. The method of death was almost identical to that of Richard Pugh some three months earlier.--Coroner's verdict: Accident. --Expertise: Senior scientist working for Easams of Camberley, Surrey, a sister company to Marconi. Dr. John Brittan had also worked at Camberley.--Circumstance of Death: Fatal car crash when he allegedly made a sudden U-turn on a dual carriageway while on his way to work, crashing at high speed into a disused cafeteria. He was found still wearing his seat belt and it was discovered that the car had been carrying additional petrol cans. None of the normal, reasons for a possible suicide could be found. --Expertise: Digital communications expert working on a defence project at Plessey; part-time member of Signals Corps SAS. --Circumstance of Death: Fatal accident when his car crashed through a barrier near Poole in Dorset.--Coroner's verdict: Misadventure. --Circumstance of Death: Found dead from a heart attack.--No inquest. Boscastle in Cornwall.--Coroner's verdict: Suicide. March 25, 1988: Trevor Knight, 52 --Expertise: Computer engineer with Marconi Space and Defence Systems in Stanmore, Middlesex.--Circumstance of Death: Found dead at his home in Harpenden, Hertfordshire at the wheel of his car with a hosepipe connected to the exhaust. A St.Alban's coroner said that Knight's woman friend, Miss Narmada Thanki (who also worked with him at Marconi) had found three suicide notes left by him which made clear his intentions. Miss Thanki had mentioned that Knight disliked his work but she did not detect any depression that would have driven him to suicide. --Coroner's verdict: Suicide. --Expertise: Software engineer with Plessey Defence Systems. --Circumstance of Death: Found dead after being electrocuted in his garden shed with wires connected to his body. --Coroner's verdict: Open. --Expertise: He had just produced a paper on a new strain of CJD. He was a CJD specialist who was killed before his work was announced to the public.--Circumstance of Death: died in a car crash. 1996: Tsunao Saitoh, 46--Expertise: A leading Alzheimer's researcher --Circumstance of Death: He and his 13 year-old daughter were killed in La Jolla, California, in what a Reuters report described as a "very professionally done" shooting. He was dead behind the wheel of the car, the side window had been shot out, and the door was open. His daughter appeared to have tried to run away and she was shot dead, also. --Expertise: Founding director of the World Health Organisation's global Aids program and founded Project SIDA in Zaire, the most comprehensive Aids research effort in Africa at the time, and in 1986 he joined the WHO to lead the global response against Aids. He became director of WHO's global program on Aids which later became the UNAids program. He then became director of the Francois-Xavier Bagnoud Center for Health and Human Rights, which was set up at Harvard School of Public Health in 1993. He caused controversy earlier this year in the post when he accused the US National Institutes of Health of violating human rights by failing to act quickly on developing Aids vaccines.--Circumstance of Death: Died in the Swissair Flight 111 crash in Canada. --Expertise: An extensive writer/ lecturer/ researcher about mental health and AIDS in the African American community. --Circumstance of Death: Died of cancer at Tulane Medical Hospital. --Expertise: A microbiologist at the Crestwood Medical Center in Huntsville.--Circumstance of Death: Died a few days after examining a sample taken from a 12-year-old girl who was diagnosed with meningitis and survived. --Expertise: Microbiologist working with victims of meningitis. --Circumstance of Death: Died three days after she studied a sample from Tricia Zailo, 19, a Fairfield, N.J., resident who was a sophomore at Michigan State University. Tricia Zailo died Dec. 18, a few days after she returned home for the holidays. November 2001: Yaacov Matzner, 54 --Expertise: Dean of the Hebrew University-Hadassah Medical School in Jerusalem and chairman of the Israel Society of Hematology and Blood Transfusions, was the son of Holocaust survivors. One of the world's experts on blood diseases including familiar Mediterranean fever (FMF), Matzner conducted research that led to a genetic test for FMF. He was working on cloning the gene connected to FMF and investigating the normal physiological function of amyloid A, a protein often found in high levels in people with blood cancer.--Circumstance of Death: Professors Yaacov Matzner and Amiram Eldor were on their way back to Israel via Switzerland when their plane came down in dense forest three kilometres short of the landing field. --Expertise: He was a biomedical expert who held a medical degree, and he also specialized in patent and intellectual property. --Circumstance of Death: Mr. Walls body was found sprawled next to a three-story parking structure near his office. He had studied at the University of California, Los Angeles. --Expertise: One of the foremost microbiologists in the United States. Dr. Wiley, of the Howard Hughes Medical Institute at Harvard University, was an expert on how the immune system responds to viral attacks such as the classic doomsday plagues of HIV, ebola and influenza.--Circumstance of Death: Police found his rental car on a bridge outside Memphis, Tenn. His body was found Dec. 20 in the Mississippi River. --Expertise: World-class microbiologist and high-profile Russian defector; defected to the United Kingdom in 1989, played a huge role in Russian biowarfare and helped to figure out how to modify cruise missiles to deliver the agents of mass biological destruction.--Background: founded Regma Biotechnologies company in Britain, a laboratory at Porton Down, the country´s chem-bio warfare defense establishment. Regma currently has a contract with the U.S. Navy for "the diagnostic and therapeutic treatment of anthrax". --Expertise: animal diseases facility of the Commonwealth Scientific and Industrial Research Organization had just come to fame for discovering a virulent strain of mousepox, which could be modified to affect smallpox. --Circumstance of Death: died at work in Geelong, Australia, in a laboratory accident. He entered an airlocked storage lab and died from exposure to nitrogen. --Expertise: Two microbiologists. Both were well known around the world and members of the Russian Academy of Science. --Circumstance of Death: Glebov died as the result of a bandit attack and Brushlinski was killed in Moscow. --Expertise: a Russian who moved to the U.S. in 1989, focused on the part of the human molecular structure that could be affected best by medicine.--Circumstance of Death: killed by fellow microbiologist Guyang (Matthew) Huang, who shot her seven times when she opened the door to a pizza delivery. Then he shot himself. --Expertise: Microbiologist --Circumstance of Death: Apparently shot himself after shooting fellow microbiologist, Tanya Holzmayer, seven times. --Expertise: Respected astrobiologist with the British Antarctic Survey, who studied the habits of microbes that might survive in outer space. --Circumstance of Death: Died in a freak road accident near his home in Cambridge, England. He was hit by a car while he was jogging. --Expertise: Known as "Dr. Flu" for his expertise in treating influenza, and a noted expert in bioterrorism of the Colorado Health Sciences Centre.--Circumstance of Death: died when the airplane he was piloting crashed near Denver. --Expertise: Expert in infectious diseases and cellular biology at the Miami Medical School --Circumstance of Death: Que left his laboratory after receiving a telephone call. Shortly afterward he was found comatose in the parking lot of the Miami Medical School. He died without regaining consciousness. Police said he had suffered a heart attack. His family insisted he had been in perfect health and claimed four men attacked him. But, later, oddly, the family inquest returned a verdict of death by natural causes. A resident of Carmel Valley --Expertise: An expert in infectious disease who helped the county prepare to fight bioterrorism after Sept. 11.--Circumstance of Death: He was in the African nation of Lesotho with Dr. Chris Mathews of UCSD, the director of the university's Owen Clinic for AIDS patients. Dr. Rickman had complained of a headache and had gone to lie down. When he didn't appear for dinner, Mathews checked on him and found him dead. A cause has not yet been determined. --Expertise: Biological warfare weapons specialist, senior post at the Ministry of Defense, an expert on DNA sequencing when he was head of microbiology at Porton Down and worked with two American scientists, Benito Que, 52, and Don Wiley, 57.--Helped Vladimir Pasechnik found Regma Biotechnologies, which has a contract with the U.S. Navy for "the diagnostic and therapeutic treatment of anthrax"--Circumstance of Death: He was found dead after seemingly slashing his wrist in a wooded area near his home at Southmoor, Oxfordshire. Oct 11 or 24, 2003: Michael Perich, 46 --Expertise: LSU professor who helped fight the spread of the West Nile virus. Perich worked with the East Baton Rouge Parish Mosquito Control and Rodent Abatement District to determine whether mosquitoes in the area carried West Nile. --Expertise: He was studying the virus that was plaguing cruise ships until he was killed by a mysterious white van in November of 2003 --Circumstance of Death: Burghoff was walking on a sidewalk along the 1600 block of South Braeswood when a white van jumped the curb and hit him at 1:35 p.m. Thursday, police said. The van then sped away. Burghoff died an hour later at Memorial Hermann Hospital. --Expertise: A haematologist. (Haematologists analyse the cellular composition of blood and blood producing tissues eg bone marrow) --Circumstance of Death: Disappeared after arriving for work on 21 July, 2003. A doctor whose disappearance sparked a national manhunt, killed himself because he could not cope with the stress of a secret affair, a coroner has ruled. --Expertise: An expert on viruses who was the principal author of a highly publicized 1992 report by the National Academy of Sciences warning of the possible emergence of new and unsettling infectious illnesses. Dr. Shope had accumulated his own collection of virus samples gathered from all over the world.--Circumstance of Death: The cause was complications of a lung transplant he received in December, said his daughter Deborah Shope of Galveston. Dr. Shope had pulmonary fibrosis, a disease of unknown origin that scars the lungs. --Expertise: Ebola, Mad Cow Expert, top of the line world class.--Circumstance of Death: Died of massive heart attack. Coincidently, both Dr. Shope and Dr. Kiley were working on the lab upgrade to BSL 4 at the UTMB Galvaston lab for Homeland Security. --Expertise: Microbiologist.--Circumstance of Death: crashed car into guard rail and ruled a stroke. --Expertise: NJ University Professor and Senior programmer analyst and adjunct professor at the New Jersey Institute of Technology in Newark.--Circumstance of Death: Body found in 3 Suitcases floating in Chesapeake Bay. --Expertise: Mallove was well respected for his knowledge of cold fusion. He had just published an open letter outlining the results of and reasons for his last 15 years in the field of new energy research. Dr. Mallove was convinced it was only a matter of months before the world would actually see a free energy device. --Circumstance of Death: Died after being beaten to death during an alleged robbery. --Expertise: Scientist and accidental politician when he opposed disposal of sewage waste program of exposing humans to sludge. Biochemist at Harvard Medical School specializing in infectious diseases.--Circumstance of Death: Suddenly developed pneumonia like symptoms then died in two weeks. --Expertise: He was the founder, and for twenty years the director, of the Cornell Center for Radiophysics and Space Research, where he was a close colleague of Planetary Society co-founder Carl Sagan. Gold was famous for his provocative, controversial, and sometimes outrageous theories. Gold's theory of the deep hot biosphere holds important ramifications for the possibility of life on other planets, including seemingly inhospitable planets within our own solar system. Gold sparked controversy in 1955 when he suggested that the Moon's surface is covered with a fine rock powder.--Circumstance of Death: Died of heart failure. --Expertise: Dr. Tulu joined the health department in 1997 and served for five years as the county's lone epidemiologist. He was charged with tracking the health of the county, including the spread of diseases, such as syphilis, AIDS and measles. He also designed a system for detecting a bioterrorism attack involving viruses or bacterial agents. Tulu often coordinated efforts to address major health concerns in Dallas County, such as the West Nile virus outbreaks of the past few years, and worked with the media to inform the public.--Circumstance of Death: Dallas County's chief epidemiologist, was found at his desk, died of a stroke. June 27, 2004: Dr Paul Norman, Of Salisbury, Wiltshire, 52 --Expertise: He was the chief scientist for chemical and biological defence at the Ministry of Defence's laboratory at Porton Down, Wiltshire. He travelled the world lecturing on the subject of weapons of mass destruction.--Circumstance of Death: Died when the Cessna 206 crashed shortly after taking off from Dunkeswell Airfield on Sunday. A father and daughter also died at the scene, and 44-year-old parachute instructor and Royal Marine Major Mike Wills later died in the hospital. --Expertise: A nuclear research scientist with McDonnell Douglas. --Circumstance of Death: Died from a huge dose of poisonous arsenic. July 21, 2004: Dr Bassem al-Mudares --Expertise: He was a phD chemist --Circumstance of Death: His mutilated body was found in the city of Samarra, Iraq and had been tortured before being killed. --Expertise: Head of the science lab which created Dolly the sheep. Prof Clark led the Roslin Institute in Midlothian, one of the world's leading animal biotechnology research centres. He played a crucial role in creating the transgenic sheep that earned the institute worldwide fame.--Circumstance of Death: He was found hanging in his holiday home. --Expertise: Iraqi nuclear scientist. He was a practising nuclear physicist since 1984.--Circumstance of Death: He was shot dead in Mahmudiya, south of Baghdad. --Expertise: Iraqi nuclear scientist --Circumstance of Death: He was shot dead north of Baghdad by unknown gunmen. He was on his way to work at Diyala University when armed men opened fire on his car as it was crossing a bridge in Baqouba, 57 km northeast of Baghdad. The vehicle swerved off the bridge and fell into the Khrisan river. Al-Daher, who was a professor at the local university, was removed from the submerged car and rushed to Baqouba hospital where he was pronounced dead. --Expertise: Two wild life scientists, Husband-and-wife wildlife veterinarians who were nationally prominent experts on chronic wasting disease and brucellosis --Circumstance of Death: They were killed in a snowy-weather crash on U.S. 287 in northern Colorado. My background is research inventions where i am in touch with quite a few other researchers some of whom have suffered massively dealing with vested interest factions. so if you value your health you better get aware of these problems and the health care systems this information certainly has the capacity to unnerve you. However if you do like to know what is going on and are not afraid of the truth read on, it is very enlightening. There are a few very important points that I would like to cover on the subject of drugs and research and treatment At present the system in England is this, and this principle will apply to other countries as well all treatment recommended by the health care people should be tested and approved and quite rightly so Obviously it costs vast sums of money to test and approve treatments because of the possible damage to people and the subsequent litigation costing millions of pounds. The point is this Where does this money come from to test and approve treatments? By far the biggest source is the drug companies. Do you think drug companies are some charitable institution – in the main they are there to make profit What do you think the implications of that statement means So take for example a researcher might go along to his local drug company and tell them his findings about this treatment he has been working on which is of outstanding value but needs testing further or approving, you might think they would be falling over themselves to know more –right, you could not be more wrong. By and large only treatments which show a profit will even get examined. Because they are in business to make a profit, not for serving the people. So many of the thousands of therapies which they see as having no profit potential do not get approved and thus by and large do not get recommended by your local doctor or hospital despite the fact that some of them do have overwhelming benefits some which have saved needless operations, needless amputations, needless pain and trauma, needless kidney failures and much loss of life. Did you know there are groups of people begging drug companies to look into certain therapies for their possible benefit but many wont –why money in the main Your local G.P/ doctor is not a researcher, what does this mean, he is very taxed with his time that means he cannot do research he finds it very difficult to keep up with what is goig on in the main he is told what to prescribe he does not even have the time often to look at research. At this minute 2004 approx 5000 Beds are being taken up by people who have had reactions to drugs. Some will die others will be maimed.That is fact So Mrs Jones by and large you will probably only get recommended treatments where there is profit in them for someone. Have you heard your local doctor recommend, Massage, Spiritual healing, Knieisiology Herbs, Light therapy, Colour therapy, Regression therapy, Osteopathy, Zappers, Magnetic devices, or Electrical Frequency devices? Has he ever mentioned nutrition what you eat how much protein carbo vitamins etc. All of these have shown their inherent worth with thousands if not millions of testimonials. As you can see this system in its present state is inherently flawed which is why you are getting recommended what you are that is until the day comes when most of the research and testing is done by an agency with no vested interests attached and a clear agenda of being objective. Acting for he people There is clear evidence that some of these drug companies will even go much further than just dismiss this proposed treatment especially if it is going to affect their profits. Imagine this 10 000 patients on some drug costing say 500-1000 pounds each per year. Average time to get well 20 yrs –income in that time –go on work it out. Then an invention comes along and hey presto we can get them well in just 6 weeks at a cost of 200 quid. Do you think they will just sit around and go err – what planet are you on jack? Eleanor Alex. Jackson and Virginia Livingston (NJ & San Diego clinics). But events started to happen; firstly, arsonists burned the Burnett Lab in New Jersey, which was validating Rife's work. Then, someone fatally poisoned Dr. Milbank Johnson, president of the Southern California American Medical Association. He died just hours before a scheduled press conference in which he was to announce that Rife's electronic therapy cured every terminal patient in a study supervised by the University of Southern California. Dr. Nemes, who duplicated some of Rife's work just 40 miles from Rife's lab, was killed in a mysterious fire, which destroyed his lab. Rife stopped work, but died at Grossmont Hospital from a lethal dose of Valium. Following Dr.
Milbank Johnson's murder, threats,other incidents followed; 30 doctors once photographed honoring Rife at a banquet now denied they ever knew him! Dr. Isaac Kendall, Rife's chief research associate and Dean of Northwestern Medical School, received $200,000 in "grants" & disappeared. Was this a bribe? Congress of Microbiology in Rome. They had found conclusive proof of a microbial cause for cancer. industry elite is and was immense. If the truth about the true cause of cancer becomes known a cheap cure will be found shortly thereafter. This will kill the cancer goose which lays tens of billions of dollars worth of eggs a year. Is there nothing these scum will not do for their god - money? No, and it does not stop there John Walsh head of the Cayce Center in Durham England had a stuttering problem which he cured using the recommendations of Edgar Cayce, naturally he wanted to share this with the stuttering society so that others may alleviate their suffering, at a meeting he was going to deliver a talk telling people of how he did it but just as he was about to speak, he was stopped and the only reason John says is that the organisers realized that if this information got out it could mean the end of their society. Doctors Hertal and Blanc undertook research on the effects of microwave ovens and declared that foods cooked in this way posed a greater risk to health than cooking by conventional means, food cooked in this way seemed to have a cancerous effect on the blood. Personally I have been extensively involved in sharing the Edgar Cayce information, Spiritual healing and some information on the Rife machine over the Internet on problems like MS Parkinsons, Galucoma, Myasthenia gravis etc. On the issue of M.S.thousands of groups who had a site on the Internet were contacted including support groups, hospitals etc. Major foundations and national societies were contacted as well. The next to try was the Myasthenia gravis association which is located in Derby England, Cayce gave a couple of readings on this problem, despite phone calls and letters and e mails including letters to the chairman not one person came back to me .I tried a few hundred other M.G. Associations throughout the Internet and only a very few were interested. The others did not even reply. in the USA were highly guilty of this. After this I tried Cayce on Parkinson's again the same procedure was followed I even tried writing and emailing to Mary Baker chairman of the Parkinson's society in England, she did not even reply. National organisations were contacted and support groups, the results only about 5% showed any interest at all. The conclusion: Clearly there are forces out there that would do anything to protect their interests, your unnecessary suffering is of no consequence to them at all. There are lots of charities, organisations, associations, support groups who are proclaiming all sorts of things, which have a sacred duty, to give you information, to conduct and fund research, to push forward their cause, which are failing miserably you the patient. They are seemingly more interested in maintaining the status quo, keeping their jobs or are just apathetic. As you can see they are not to be relied upon if you value your health.Conclusion One must take responsibility for their own wellness, not hand the problem over to others. I advocate that most research should be done by perhaps government organizations with the only vested interest in mind of that of the patient, but that is a long way off. As many NEXUS readers will know, Dr Hulda Clark has helped thousands of people around the world cure themselves of many ailments and diseases. Her approach is to remove exposure to solvents and to remove parasites from the body. The patients in her clinic in Mexico most of them terminally ill, but getting better under Dr Clark's supervision had to be sent home to try to do the protocols on their own. Dr Clark was escorted from prison on 4 October and arrived in Indiana on 6 October at 2.30 am. A hearing was held at 9.00 am and bail was set at US$10,000. Dr Clark was offered a plea bargain with a fine if she pleaded guilty, but she pleaded not guilty. The trial will be held on 2 February 2000. American". Died in shame and ignominy George Lahovsky: Inventor of the "multi-wave oscillator". Run over by a car and died 1943. DR Stanislaw Burzynski: Ordered by FDA to stop development of his highly effective 'anti-neoplaston' treatment program. Raided and had all his scientific, medical and personal records seized which were never returned Gaston Naessens: microbiologist - still alive and working with Rife type microscope today. Edward J. McCabe: Health journalist who reported success of oxygen therapy. Sentenced to 3 years in prison on the pre-text of tax evasion 1999 (and served 2 years).DR William F. Koch: Medical doctor, Professor of chemistry, histology and physiology. Inventor of "Glyoxylide catalyst" cure for cancer. Sued by FDA but was acquitted after 600 doctors testified in his favor. Died of poisoning, 1967.
apheuresis oxygen therapy. Imprisoned for 4 years. Claims he survived six assassination attempts whilst in prison.DR George A. Freibott, IV. President of the American Naturopathic Association, consultant for International Association for Oxygen Therapy, US Government approved and internationally accepted expert witness on oxygen/oxidation therapies. Survived numerous assassination attempts and several anonymous phone calls threatening him with his life.DR James Boyce: Turned 254 people HIV+ to HIV- using ozone therapy: Charged with using unproven methods and sentenced to 5 years in prison. Had his medical license revoked. Ken Thiefault sold ozone generators: Sentenced to 7 years in prison for making medical claims for ozone generators. His wife was sentenced to three years. In Paul Millers book on Harry Edwards and spiritual healing there are a number of issues which are mentioned. the patient in a few more years to check his progress. At the right time Harry then raised the issue again only to be told that too much time had elapsed. 2. Another famous expletive was wrongly labelled x-rays and spontaneous healing. Many times doctors opened up a patient to find a growth only to find that it was gone. Mistaken diagnosis was another favourite.So you see that there are certain elements within the medical profession who would gladly not see this work at all to the cost of millions of peoples suffering. Their motives can only be guessed at. On the other hand there are many brilliant doctors out there some of which attended the sanctuary witnessing many healings and many presented their own problems to Harry for healing. Oh yes the church, Harry it seems had many dealings with the church and it seems was very disappointed to see that the church had failed miserably its duty to go forth and heal the sick as the master Jesus commanded. Harry had invited numerous priests and bishops to his healing demonstrations where they could witness right in front of their very eyes some of the fantastic things which were going on. He was disappointed that the archbishop of Canterbury had declined the invitation to attend one of his healing demonstrations right under the cathedral. But it started the seemingly very little known commission to investigate divine healing. This commission had the archbishop of Canterbury and York seeking the co-operation of the British medical association who appointed a number of physicians to examine the evidence put before them by the man they had jointly denigrated. It was over two years before the Anglican Church got their act together. investigation –six can you imagine that number for a proper investigation. Harry thought the same and submitted seventy many of which were considered incurable by their very own doctors. After submitting these and giving a lengthy address the response was astonishing One of these so called doctors stood up and claimed they could have been spontaneous healing, but Harry had pointed out it was the doctors themselves who proclaimed these people were incurable. This information is a follow up of the Institute of Medicine report which hit the papers in December of 1999, but the data was hard to reference as it was not in peer-reviewed journal. Now it is published in JAMA which is the most widely circulated medical periodical in the world. The author is Dr. Barbara Starfield of the Johns Hopkins School of Hygiene and Public Health and she describes how the US health care system may contribute to poor health. These total to 250,000 deaths per year from iatrogenic causes!! What does the word iatrogenic mean? activity, manner, or therapy. Used especially of a complication of treatment. Dr. Starfield offers several warnings in interpreting these numbers: First, most of the data are derived from studies in hospitalized patients. Second, these estimates are for deaths only and do not include negative effects that are associated with disability or discomfort. Third, the estimates of death due to error are lower than those in the IOM. In any case, 225,000 deaths per year constitutes the third leading cause of death in the United States, after deaths from heart disease and cancer. Even if these figures are overestimated, there is a wide margin between these numbers of deaths and the next leading cause of death (cerebrovascular disease). 13th for years of potential life lost (excluding external causes) 11th for life expectancy at 1 year for females, 12th for males 10th for life expectancy at 15 years for females, 12th for males10th for life expectancy at 40 years for females, 9th for males 7th for life expectancy at 65 years for females, 7th for males 3rd for life expectancy at 80 years for females, 3rd for males 10th for age-adjusted mortality The poor performance of the US was recently confirmed by a World Health Organization study, which used different data and ranked the United States as 15th among 25 industrialized countries. No Free Lunch: A non-profit organization whose mission is to encourage health care providers to practice medicine on the basis of scientific evidence rather than on the basis of pharmaceutical promotion. Public Citizen Health Research Group: Promotes research-based, system-wide changes in health care policy and provides oversight concerning drugs, medical devices, doctors and hospitals and occupational health. Worst Pills, Best Pills: A searchable, online drug database that provides comprehensive information about 538 prescription drugs and warns of 181 drugs that are unsafe or ineffective. A project of Public Citizen HRG. The Medical Letter on Drugs and Therapeutics: An independent, peer-reviewed, nonprofit publication that offers unbiased critical evaluations of drugs, with special emphasis on new drugs, to physicians and other members of the health professions. American Medical Student Association (AMSA) PharmFree Campaign: Aiming to revitalize professionalism in medical education – to teach medical students about the ethics of drug company interaction with health professionals and encourage them to make the rational, informed decision to eschew “free” gifts from the pharmaceutical industry. The Prescription Access Litigation (PAL) Project: Works to make prescription drug prices more affordable for consumers, using class action litigation and public education. IMS Health Top Line Industry Data: Statistics of current and past years’ topline US and global pharmaceutical trends. Key indicators include: leading companies, leading products, leading therapeutic classes, promotional spending, and leading channels of distribution – as measured by prescription sales and dispensing. Dangerous Prescription Produced and directed by Andy Leibman; Aired on Frontline. More than a dozen dangerous drugs have been pulled off the market since 1997. Why were they approved in the first place? An Investigation of America’s drug safety system. The Other Drug War Written, produced and directed by Jon Palfreman & Barbara Moran; Aired on Frontline. America’s war over prescription drugs has dragged on for nearly twenty years. Why are the drugs so expensive? And can prices be controlled without jeopardizing innovation? Selling Sickness: An Ill for Every Pill Directed by Catherine Scott, Produced by Pat Fiske, Co-Written by Ray Moynihan, and Distributed by First Run Icarus Films. Selling Sickness exposes the unhealthy relationship between society, medical science and the pharmaceutical industry. Sicko Directed by Michael Moore. In theatres now. Opening with profiles of several ordinary Americans whose lives have been disrupted, shattered, and—in some cases—ended by health care catastrophe, the film makes clear that the crisis doesn't only affect the 47 million uninsured citizens—millions of others who dutifully pay their premiums often get strangled by bureaucratic red tape as well. Side Effects Written and directed by Kathleen Slattery-Moschkau. A coming of age comedy whose main character is a drug company sales rep, based on the director’s decade-long experiences employed by the pharmaceutical industry. The Drug Pushers, by Carl Elliott in The Atlantic Monthly. Public Library of Science, Issue on Disease Mongering.